SoftPLC's open architecture provides an Application Program Interface (API) that allows additional functions, called TOPDOC Loadable Modules or "TLM's", to be used to expand the system's functionality. TLMs are written in C or C++, and can be created using the SoftPLC Programmer's Toolkit. A TLM can implement a driver and/or one or more ladder instructions, called TLI's (TOPDOC Loadable Instructions). TLMs can be written as strictly software-based functions or to interface to specific hardware such as third-party communication or I/O cards. Many TLMs are available at no cost. The most commonly used TLMs are included with each SoftPLC, and only need to be selected for use and configured. If your SoftPLC does not include the TLM you want to use, it can be downloaded from this web site or by contacting Technical Support. Other specialized or more complex TLMs are available for a small fee. Some of these may require specific hardware or factory installation due to hardware dependencies. On this webpage, these are indicated with the icon and a link to our WebStore. NOTE: There are many standard SoftPLC features that are not implemented with TLM's. These are not described here, but in the Universal Features section. TLMs can be containers for groups of ladder instructions, individually called TOPDOC Loadable Instructions (TLIs). 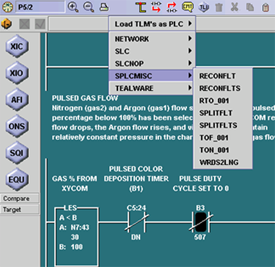 The SoftPLC programming software TOPDOC NexGen, dynamically learns about TLIs used from the SoftPLC Controller when it connects online. The most popular instruction TLM's are listed below. LOGGER.TLM: The instructions which enable SoftPLC to log data to CSV files. Includes an instruction to copy the file to an alternative location, such as a USB memory stick or network drive. LOGDATA.TLM: The instructions which enable SoftPLC to log data to a binary file. Includes a Windows-compatible utility program to convert the binary log file to ASCII for use with spreadsheets or database programs. Useful for high-speed/high-volume data logging. Zip file includes TLM, manual and conversion utility. DTDISK.TLM: The instructions which allow the saving (write to disk) and loading (read from disk) of a block of data table words to/from a text file or a compressed binary file. Zip file includes TLM and manual. SENDMAIL.TLM: An add-on firmware option for SoftPLC (Cat No SPZ-EML) which provides the capability to send SMTP emails and text messages, including attachments such as log files. COMGENIUS.TLM: COMGENIUS can be used to perform bi-directional ASCII serial communications to devices via RS-232, RS-422, or RS-485 links. The free TLM implements several TLIs for use with up to 36 serial ports in a SoftPLC system. COMGENIUS instructions can be used for Modbus RTU Master when communicating to simple devices such as a meter scale or other process equipment. General Motors reduced a PLC-5 program by over 400 rungs using COMGENIUS in place of PLC-5 String instructions to communicate to a robot controller! TAGWELL.TLM: A free instruction that sends a set of data table (tag) values to SoftPLC's TagWell remote management platform. SLC.TLM: Free SLC-500 instructions for SoftPLC beyond the standard instruction set (includes ABS, ABSI, DCO, DDV, ENC, SCP, SCL, SQCW, SQCF, SWP, and NoOp stubs for instructions that have no exact equivalent, for conversion purposes). Zip file includes TLM and manual. SPLCMISC.TLM: A free collection of TLI's, see the linked PDF for a complete list. Includes convert 16 bit integer to float and vice versa (primarily for use with the Tealware HSC11 High Speed Counter Module), Timers that provide accuracy to 1 millisecond (0.001 time base), and more. MATH.TLM: Free set of enhanced math instructions for SoftPLC, including Absolute Value, Minimum, Maximum, and Modulus. TLMs can be drivers to communicate to devices or networks. Some driver TLM's also include TLI's (TOPDOC Loadable Instructions), which are used to control driver performance during runtime and for driver monitoring / troubleshooting. The most popular communication driver TLM's are listed below, most are automatically included with each SoftPLC. For a full list, refer to our Resource Library. Modbus Serial Master (MODBMAST.TLM): This is a free driver that enables SoftPLC to act as a Modbus RTU/ASCII serial master for up to 247 slaves on each of up to 32 serial ports. This is a powerful driver for I/O or communications intensive applications. Modbus Serial Slave (MODBSLAV.TLM): This free TLM adds Modbus RTU/ASCII slave capabilities to a SoftPLC runtime and allows it to participate in master-slave communications between intelligent devices on a serial RS-232, RS-485, or RS-422 communications link. Modbus Ethernet Slave (MBIPSLAV.TLM): This free TLM implements the slave (or server) side of the ModbusTCP protocol. As an extension of the standard, it also implements the same protocol on UDP/IP. It may be used to talk to an operator interface or for peer-to-peer communications between controllers on an ethernet. Modbus Ethernet Master (MBIPMAST.TLM): This free TLM implements the master (or client) side of the ModbusTCP protocol. As an extension of the standard, it also implements the same protocol on UDP/IP. This TLM may be used to monitor and control ethernet based I/O (eg:Tealware) or other devices such as drives, or it may be used to communicate with other controllers on an ethernet. NOTE: Some communication protocols are native to SoftPLC and are not implemented by TLM's. These include A-B Ethernet, DF1 and Data Highway Plus. Smart A-B Remote I/O Master (RIO.TLM): This free driver enables a Smart SoftPLC or Smart Gateway to be a master/scanner on one or more Allen-Bradley RIO networks. This TLM implements the master or scanner role within the Allen-Bradley Remote I/O protocol. This functionality is only available on Smart SoftPLC's factory equipped with the Smart A-B RIO Master Interface hardware (Cat. No. SM-ABRIOM5 and/or SM-ABRIOM6). A-B Remote I/O (KTX.TLM): This free driver interfaces a Hardbook SoftPLC or another SoftPLC with ISA or PCI slots to Allen-Bradley Remote I/O (RIO) via the A-B 1784-KTS, -KTX, -KTXD, -PKTS, -PKTX, or -PKTXD cards. These drivers allow a SoftPLC to control remote 1771 I/O, Block I/O (1791), Flex I/O (1794), SLC-500 remote I/O, and all compatible devices including third party products that can connect to the RIO "blue hose" link & communicate via block transfer such as drives, operator interfaces, etc. Smart A-B Remote I/O Slave (RIOSLAVE.TLM): This free driver enables a Smart SoftPLC or Smart Gateway to be emulate remote racks on one or more Allen-Bradley RIO networks. This TLM implements the adapter role within the Allen-Bradley Remote I/O protocol. This functionality is only available on Smart SoftPLC's factory equipped with the Smart A-B RIO Adapter Interface hardware (Cat. No. SM-ABRIOA5 and/or SM-ABRIOA6). Ethernet/IP (ETHERIP.TLM): This free TLM implements the Ethernet/IPTM protocol. Can be used to receive data from an Ethernet/IP Master such as a Rockwell Automation/Allen-Bradley PAC/PLC or an HMI/SCADA product, or to act as an Ethernet/IP Master to devices or I/O. Smart Data Highway Plus (included with built-in drivers, not a TLM): This free driver enables a Smart SoftPLC or Smart Gateway to communicate on the peer-to-peer Data Highway Plus network. This functionality is only available on Smart SoftPLC's factory equipped with the Smart A-B DH+ Interface hardware (Cat. No. SM-ABDH5 and/or SM-ABDH6). A-B Data Highway (included with built-in drivers, not a TLM): This free driver interfaces a Hardbook SoftPLC or another SoftPLC with ISA or PCI slots to Allen-Bradley Data Highway Plus via the A-B 1784-KTS, -KTX, -KTXD, -PKTS, -PKTX, or -PKTXD cards to perform peer-to-peer messaging. Smart Tealware Local I/O (SMART.TLM): A free driver for use with SoftPLC Corporation's Tealware IO and Smart SoftPLCs. Supports up to 12 local racks. Includes a HZ TLI to enable use of the Tealware HSC11 module for frequency inputs. Fieldbus Network Interface (HILSCHER.TLM): This free TLM provides support to Hilscher GmbH CIFX, CIF50 and CIF104 interface cards enabling a SoftPLC to interface to a industrial networks such as DeviceNet, Profibus, Interbus and others. A-Series Modules (ADAM.TLM): This free TLM implements serial TLI's to communicate to A-Series I/O modules (Advantech ADAM-4000). Although many A-Series modules support Modbus or ModbusTCP communications, others support only the proprietary protocol implemented with this TLM. ICP-DAS 7000 Series (ICO7000.TLM): Driver TLI's for ICP-DAS Series 7000 I/O modules which use the proprietary DCON serial protocol rather than Modbus. The SoftPLC Web Server (Cat. No. SPZ-WEB) is an HTTP server that can be added as an option to any SoftPLC® based controller or gateway. The Web Server is firmware that installs and runs in the SoftPLC CPU, there is no additional hardware required. The SoftPLC Web Server supports HTML pages, Java Script, C++ and other technologies. Any modern web browser can be used with the SoftPLC Web Server, and any HMTL development tool can be used to develop the web pages for SoftPLC (including text editors). The web pages reside in the SoftPLC, normally on the flash disk. This includes the HTML source, images (eg: *.jpg, *.png), or even sound or video files. One common use of the web server is to create a page for users to access process or machine documentation files which reside in the SoftPLC (eg: *.pdf, *.dwf, *.txt). Included with the SoftPLC Web Server license is a Webpage Developer Toolkit that includes a number of widgets you can use on your web pages to display/change live bit states and data table values. SoftPLC also offers web page development services if you prefer to not create your own. 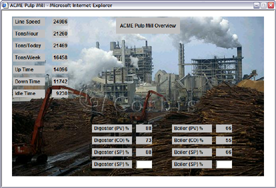 Rather than purchasing a dedicated HMI or SCADA license for each system/user, create web pages to display production data or machine status, or to allow operators to make changes to machine operating parameters or select recipes. These pages can then be viewed on any web browser. Useful for both local in-plant as well as remote access over the internet. Equip your SoftPLC system with a wireless/bluetooth interface, and access the system without needing modems/connections! SoftPLC supports multiple web sites to separate pages viewed by job function, etc. With its huge memory and storage capacity, SoftPLC can easily become a data-logger and report generation system. For example, you could use the LOGGER or LOGDATA ladder instruction(s) to save time-stamped process values to a file in CSV, XML, TXT or other formats. This file can then be viewed from a web page. Web pages developed for the SoftPLC embedded Web Server are nearly identical to those that would reside in TagWell, minimizing development effort for systems that support both local browsing and remote cloud-based access. An add-on optional firmware package implements an embedded high performance firewall/VPN in any SoftPLC with routing capability (eg: 2 ethernet interfaces). The Firewall Package (Cat No SPZ-FW) can be used to protect ethernet to ethernet connections such as industrial network to business network, or industrial networks/devices connected to remote sites via the internet. Powerful security features block dangerous and/or unwanted communications from entering your SoftPLC. With the Hot Standby System in place, in the unlikely event the SoftPLC designated as the "master" were to fail, a second identically configured SoftPLC designated as "backup" is able to take over the I/O control with no downtime, commonly referred to as "bumpless transfer". Add-on Features: These items are available for purchase for new and/or previously purchased SoftPLC controllers. I/O Driver TLM's: Most of these drivers are included in the base SoftPLC firmware, or if not can be downloaded at no cost. Communication/Protocol TLM's: Most of these drivers are included in the base SoftPLC firmware, or if not can be downloaded at no cost. Instruction TLM's: Many of these instructions are included in the base SoftPLC firmware, or if not can be downloaded at no cost. Describes the features/specifications of the SoftPLC Hot Standby system, including the Arbitrator hardware and Hot Standby TLM. User manual for the SoftPLC Hot Backup system, includes hardware configuration/wiring, HOTBACK.TLM configuration, and programming examples. User manual for creating animated web pages for the embedded SoftPLC Web Server and for Tagwell web pages. User manual for the SENDMAIL add-on firmware option which provides the capability for SoftPLC to send SMTP emails or text messages. Local I/O driver for use with SoftPLC Corporation's Tealware I/O and Smart SoftPLC's equipped with a Backplane3 or LocalPorts interface. Supports up to 12 local racks. Includes a "HZ" TLI which enables use of the Tealware High Speed Counter Module (Cat No HSC11) for frequency inputs. User manual for the Smart A-B RIO Master TLM, which works in conjunction with the internal A-B RIO interface (Cat No SM-ABRIOM5/ABRIOM6). Allows SoftPLC to control A-B RIO drops, and for a Smart SoftPLC/Gateway to use block transfer commands over RIO to communicate to PanelViews, drives or other devices on the network. User manual for the Smart A-B RIO Slave/Adapter TLM, which works in conjunction with the internal A-B RIO interfaces (Cat No SM-ABRIOA5/ABRIOA6). Allows a Smart SoftPLC/Gateway to act as a A-B RIO drop. User manual for the SoftPLC SDI-12 sensor bus driver, used with the Micro SoftPLC Model SPBB-6DI2SP1AI carrier board. This free TLM implements serial TLI's to communicate to A-Series I/O modules (Advantech ADAM 4000). Although many A-Series modules support Modbus or ModbusTCP communications, others support only the proprietary protocol implemented with this TLM. This powerful driver supports both master and/or slave functions on fieldbus networks such as Profibus, DeviceNet, and many others. Communicate to any compatible products from up to 8 Hilscher interface cards (SoftPLC Models SPO-104X/104CX/PCIX/P50X) for ISA, PCI, PCI-104 or PC/104 buses. The network configuration software is included with the interface card. This driver interfaces a SoftPLC Hardbook to Allen-Bradley Remote I/O (RIO) such as 1771, Block I/O (1791), Flex I/O (1794), SLC-500 remote I/O, and all compatible devices including third party products that can connect to the RIO "blue hose" link & communicate via block transfer such as drives, operator interfaces, etc. The SoftPLC Hardbook interface to RIO is via the A-B 1784-KTS, -KTX, -KTXD, -PKTS, -PKTX, or -PKTXD cards. Driver TLI's for ICP-DAS Series 7000 I/O modules which use the proprietary DCON serial protocol rather than Modbus. Zip file includes TLM and manual. COMGENIUS.TLM is a set of ladder instructions which enable SoftPLC to perform general purpose ASCII communications to/from serial devices on RS-232/485/422 networks. The user manual includes programming example of how to implement the Modbus RTU Master protocol. This TLM is included with every SoftPLC. User manual for the free instruction that sends a set of data table (tag) values to SoftPLC's TagWell remote management platform. Serial Modbus RTU Slave driver allows SoftPLC to participate in master-slave communications, such as an operator interface or peer-to-peer between intelligent devices, over a serial RS-232, RS-485, or RS-422 link. SoftPLC's ModbusTCP Master supports most Modbus commands on TCP/IP and UDP/IP and can be used with Tealware I/O via a Smart Adapter, or with other vendor's ModbusTCP compatible I/O systems and devices. The ModbusTCP Slave driver implements the slave (or server) side of the ModbusTCP protocol, and supports most Modbus commands on TCP/IP and UDP/IP. It may be used to talk with a SCADA/HMI system or for peer-to-peer communication between controllers on an ethernet. Instructions which enable SoftPLC to log data to CSV files. Includes an instruction to copy a logfile to an alternative location, such as a USB memory stick or network drive. Instructions which enable SoftPLC to log data to a binary file. Includes a Windows-compatible utility program to convert the binary log file to ASCII for use with spreadsheets or database programs. Useful for high-speed/high-volume data logging. Instructions which allow the saving (write to disk) and loading (read from disk) of a block of data table words to/from a text file or a compressed binary file. Free set of enhanced math instructions for SoftPLC, including Absolute Value, Minimum, Maximum, and Modulus. Free SLC-500 instructions for SoftPLC beyond the standard instruction set (includes ABS, ABSI, DCO, DDV, ENC, SCP, SCL, SQCW, SQCF, SWP, and NoOp stubs for instructions that have no exact equivalent, for conversion purposes). Zip file includes TLM and manual. A free collection of TLI's, see the linked PDF for a complete list. Includes convert 16 bit integer to float and vice versa, Timers that provide accuracy to 1 millisecond (0.001 time base), and more. Included as standard with each SoftPLC. COMGENIUS.TLM is a set of ladder instructions which enable SoftPLC to perform general purpose ASCII communications to/from serial devices on RS-232/485/422 networks. The user manual includes programming example of how to implement the Modbus RTU Master protocol.